Whoo boy what a week it’s been! Thursday afternoon Jason spotted a baby fawn in the neighbor’s yard right at the tree line. Upon doing some research I found that sometimes momma deer will leave the baby to go find food and come back within a few hours. So we left him alone for that evening, even though he was crying and not walking very well. We didn’t want to impose on nature if we didn’t have to. By that evening the baby had moved to the woods behind our fence line and was still crying out for his momma. Jason walked back to check on him and saw a doe not too far away. Naturally, we assumed this was the mother deer and left them alone. There was no sound from the baby the next morning so we thought all was good. Then that afternoon Jason heard him crying again. At that point he decided we needed to do something, so he went in search of the baby. 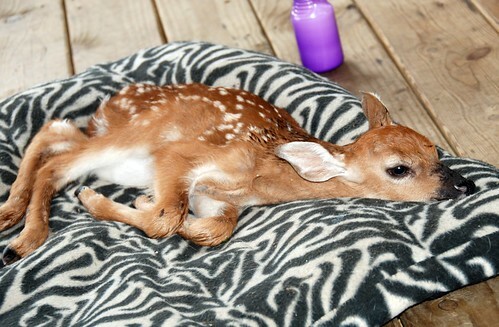 He found him curled up in an open area of the woods behind the house, still crying. Jason walked right up to the baby, but the baby didn’t move. Jason then reached out to pet him so he knew he meant no harm and the poor little thing got scared and ran about 20 feet before he face planted in the dirt. Jason went to him again and did the same thing, and the wee baby ran again, only making it a few steps before he collapsed. So Jason picked him up and brought him on the porch and put him on one of the dog beds. He and Portia got him to drink a few ounces of milk before he tired out to take anymore. At that point he called the Kentucky Wildlife Association who referred us to a vet clinic we could take the baby to. From there a wildlife sanctuary came to pick him up and take him to their facility where they will nurse him back to health and re-release him when he is strong and healthy enough. 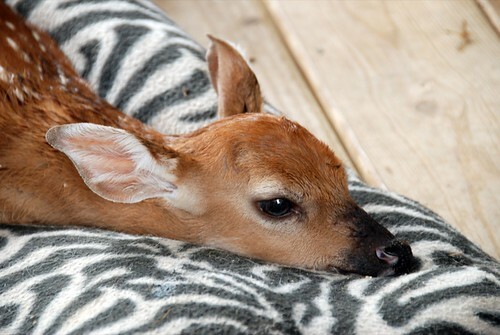 You can read the full store on our PetResearch site in case you ever find a baby fawn that appears to be abandoned. And of course I got a few pictures! 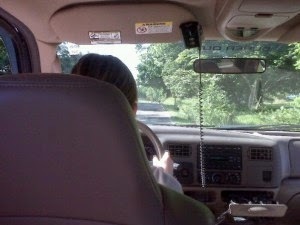 In other exciting news, Portia got her driving permit on the same day! *gah! 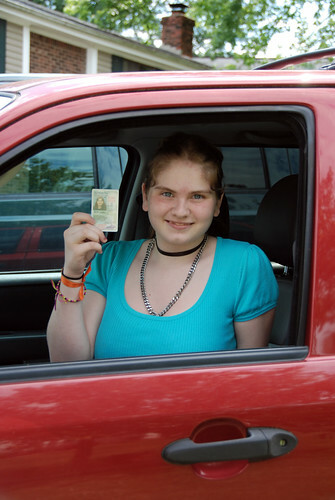 * She’s been a little hesitant to get it (she was eligible to get it when she turned 16 in January), but once she really thought about it and realized she could go to Taco Bell whenever she wanted to once she got her license it was on! (Had I known this I’d have dangled a taco in front of her 5 months ago!). She is getting my 2003 Ford Escape since I only drive my F150 now. She’s been out driving a few times and is picking up the ropes pretty well. 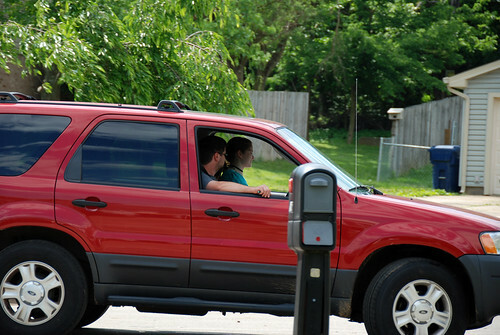 Of course, I had to get some photos of her first driving experience. And she’s off…and smiling all the way! Awwww that behbeh is too cute!!!! I want one!! lol! And a huge CONGRATS to Portia (love her name, btw!) on getting her drivers!!! Yay!! I Can't Believe You Actually Put This Up!